Why Would Edward Snowden Want to Go to Ecuador? Since Edward Snowden  revealed mass surveillance tactics of the US and British governments, the saga of the U.S. National Security Agency ex-contractor has continued. Snowden's actions have earned him both detractors and supporters; the former accuse him of treason and of endangering the security of the United States, while the latter consider him a champion of individual liberties. 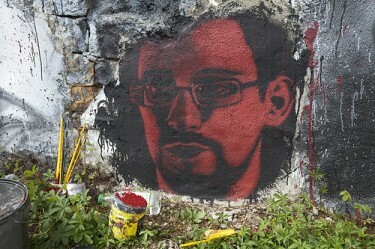 Snowden's future remains uncertain. At the time of this article's original publication (July 3 on es.globalvoicesonline.org ), the young American was reportedly staying in Moscow's Sheremetyevo Airport , having requested asylum  from twenty countries, including Cuba, Germany, Austria, and China. [Bolivia, Nicaragua and Venezuela have now offered him asylum . Added July 8.] Snowden initially sought status in Ecuador, but the Ecuadorian government is now sending mixed signals on whether or not his request will be granted. Nevertheless, many wonder: Why would Snowden want to go to a country like Ecuador, where press freedom has historicallly been restricted? Snowden describes himself  as a person who does not tolerate injustice. Indeed, Snowden decided to serve in the military during the Iraq War, since, according to him , he “felt like [he] had an obligation as a human being to help free people from oppression.” However, an injury in both legs prevented him from completing his military training, and so he moved from the Army into the world of information technology. Shortly thereafter, he went to work as a contractor for the National Security Agency (NSA) through the consulting firm Booz Allen Hamilton. Photo from Flickr/Adobe of Chaos (CC BY 2.0). Snowden decided to speak out against the government's high level of access to private information, which it obtained through PRISM, a clandestine electronic surveillance program operated by the NSA. He currently stands accused  of intellectual property theft, unauthorized disclosure of defense information, and willful communication of classified information to an unauthorized person, in this case the journalists of Great Britain's The Guardian  and the United States’ Washington Post . Snowden has stated that he wants to live in a country that abides by his principles. But his words are not wholly consistent with his actions. Why did he flee to countries known to restrict Internet access and freedom of expression (like Russia or China, by means of Hong Kong), and why would he try to settle in Ecuador? In Ecuador, one of the more controversial recent cases  threatening freedom of expression is that of Assembly member Clever Jiménez and political activists Fernando Villavicencio and Carlos Figueroa, who were accused of libel by Ecuadorian President Rafael Correa for criticizing him in political speeches. The court ruled in favor of Correa and convicted them  [es] “of the crime of insulting the president.” Figueroa was sentenced to six months in jail, while Villavicencio and Jiménez received a sentence of 18 months. This is not the first time that the court has ruled in favor of Correa when he files lawsuits, thus restricting the opinions of his staunchest detractors. According to a report from Human Rights Watch , after his dispute  with the newspaper El Universo, Rafael Correa's government has approved a series of reforms  that will place much stronger restrictions on any media entity that tries to criticize his government. According to the Committee to Protect Journalists , the new Communications Law grants the authorities powers that could lead to media censorship. In addition, the law seeks to regulate monopolization of the media, but it also imposes worrying restrictions against journalists of all kinds. The law prohibits  “repeated attempts to destroy a natural or legal person with the goal of reducing their public credibility,” a decision that interferes with journalists’ ability to report on questionable activities of government authorities. In a recent press release , the Organization of American States said that the law could “severely hinder the exercise of the right to freedom of expression and have a serious chilling effect that is incompatible with a democratic society.” Journalists who violate the law could be subject to civil or criminal sanctions. Snowden's revelations have unleashed an international diplomatic crisis, the likes of which have not been seen since Julian Assange of Wikileaks did the same several years ago (Assange was granted asylum  in Ecuador). The US asked Ecuador to reject Snowden; however, like other leftist Latin American countries, Ecuador has demonstrated its disapproval of Washington's influence in the region through the defiance it has shown before this request. Should Ecuador grant Snowden asylum, the country would face pressure from the United States. But this also could pose another problem to Rafael Correa by shining a light on his well-known animosity toward the media and personal liberties, making the issue well known beyond Ecuador's borders (as explained by the magazine Mother Jones ). If Snowden wants to live in a country that agrees with his ideals of freedom and transparency, he should carefully consider his desire to live in Ecuador.